2012 Mighty Viper PRO-1000AG CNC Vertical Machining Center s/n 017859 w/ Hartrol / Fanuc AI-100 0i-MD Controls, 24-Station Side Mounted ATC, CAT-40 Taper Spindle, 9,000 RPM, 15Hp Spindle Motor,Geared Drive, Thru Spindle Coolant, 4 th Axis Interface (NO BOARD), Travels “X”=39”, “Y”=24”, “Z”=25”, 24” x 45” Table, Coolant. 2009 Mighty Viper VMC-2100AH CNC Vertical Machining Center s/n 002335 w/ Mitsubishi Controls, 32- Station ATC, CAT-50 Taper Spindle, 47 ¼” x 82 ½” Table, Coolant. 1997 Mighty Viper V-1500AGXT CNC Vertical Machining Center s/n 000591 w/ Mitsubishi M530 Controls, 30-Station ATC, 50-Taper Spindle, Chip Conveyor. 1998 Daewoo ACE-H500 2-Pallet CNC Horizontal Machining Center s/n AH5X0089 w/ Fanuc Series 16M Controls, 60-Station ATC, CAT-50 Taper Spindle, 6000 Max RPM, 25Hp Spindle Motor, 4 th Axis ThruPallets @ 1° Indexing, Travels “X”=32”, “Y”=26”, “Z”=26”, (2) 19.7” x 19.7” Pallets, Coolant. 2006 Mighty S-500 2-Pallet CNC Drilling / Tapping Center s/n F00C004 w/Mitsubishi M64 Controls, 20-Station ATC, BT-30 Taper Spindle, 12,000 Max RPM, 7Hp Spindle Motor, Travels “X”=20”, “Y”=16”,“Z”=12”, (2) 18” x 23 ½” Tables, Coolant. Mighty Viper B4000GDW CNC Bridge Style Machining Center s/n 2338 w/ Mitsubishi M625 Controls, 5-Axis Ready, 40-Station ATC, 50-Taper Spindle, 3800 Max RPM, Travels “X”=160”,“Y”=102”, “Z”=42”, Dual Chip Augers, Chip Conveyor, Coolant. 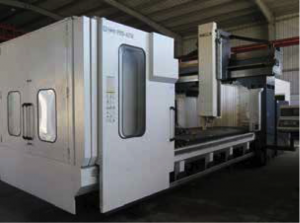 2006 Mighty Viper B4000GTDW CNC Twin Spindle Bridge Machining Center s/n 1551 w/Mitsubishi M530 Controls, 20-Station ATC’s (Each Spindle), 6000 Max Geared RPM (EACH), 35Hp Spindle Motors, CAT-50 Taper Spindles, Travels “X”=160”, “Y”=80”, “Z”=32.3”, 165” x 80” Table, 45,000 Lb Table Cap., (2) Harbor Chillers, Dual Chip Augers, Chip Conveyor, Coolant. 2013 Mighty Viper PRO-4210 CNC Bridge Type Machining Center s/n 016911 w/ Hartrol-Fanuc A1300 Controls, ATC, CAT-50 Taper Direct Drive Spindle, 10,000 RPM, Dual Chip Augers, Chip Conveyor, Coolant. 2003 Mighty Viper VMCB-3120PTX CNC Bridge Type Machining Center s/n 004749 w/ Fanuc 18MC Controls, 40-Station ATC, CAT-50 Taper Spindle, 8000 Max Geared Spindle RPM, 30Hp Motor, Travels “X”=118”, “Y”=100”, “Z”=28”, Harbor Chiller, 17,600 Lb Table Cap., Coolant. 2000 Mighty Viper VMC B-3000PXT CNC Bridge Type Machining Center s/n 0022677 w/ Mitsubishi M625 Controls, 40-Station ATC, CAT-50 Taper Spindle, 8000 Max Pulley Type RPM, 30Hp Spindle Motor, Travels “X”=118”, “Y”=76”, “Z”=28”, 72” x 122” Table, Dual Chip Augers, Chip Conveyor, Coolant.